Description: Caespitose perennial to 1 m high. Leaves with ligule truncate, leathery, 0.3–1 mm long, ciliate; auricles usually with tufts of stiff hairs to 1 mm long; blade weakly rolled, c. 3 mm wide, slightly to strongly ribbed, scaberulous to scabrous, margins glabrous or strongly scabrous. Panicle exserted, contracted or expanded, 25–45 cm long. Spikelets gaping widely after floret disarticulation, otherwise tightly closed, 12–20 mm long (excluding awn). 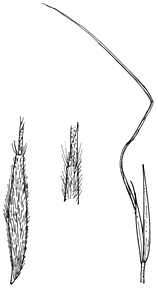 Glumes unequal, narrowed abruptly at the tip. Lemma 6–9.5 mm long, tuberculate, scabrous with antrorse hooks at the apex, reddish brown at maturity; lobes minute; coma 1.2–2 mm long. Callus strong, curved, silky. Awn strongly twice bent, 3–6 cm long. Palea subequal to the lemma. 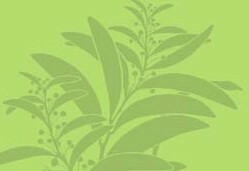 Distribution and occurrence: Grows in wooded areas chiefly of the Tablelands and Slopes.